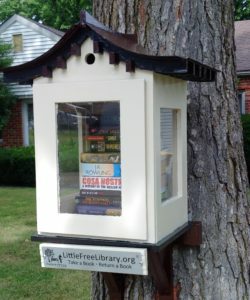 For those who don’t know what a Free Little Library is, it’s a small box from which neighbors can borrow and/or trade books. The tag line is Take a Book, Leave a Book, but I have a surprising number of people who take a book without leaving another and then return it when they’ve finished. Which is a perfectly acceptable way to use it too. There are as many designs as you can imagine. 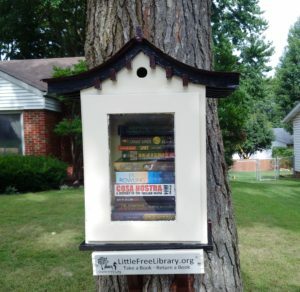 Anything from a plastic bin on someone’s porch to repurposed phone booths or elaborate, purpose-built pieces of art. This is mine, charter #27529. Small and no where near as fancy as some, but I’m happy with it. It’s been up for a while, but it wasn’t until recently that I discovered that a lot of stewards take “shelfies” to share what’s coming through their library. I loved the idea and decided to adopt it. I’ll add them week by week here. I also made a Facebook page for it, so local people can see what’s available before trekking over. But before I let you run off to look at it, i have a few words for authors. For the most part, I let what comes and goes organically be what fills the box. I consider my main duties keeping it neat and clean. But more goes out than comes in sometimes and if traffic slows down I rotate in different books to keep people interested. (Ok, an honest edit here. I change at least some of the books out on Weds and Sat. It’s basically play time for me.) This means I maintain a certain amount of control over the selection and with this leeway I make an effort to keep at least one SP/Indie book in the library at all times, as well as books that promote diversity (by/about non-white, cisgendered, straight, able-bodied people). I might not succeed at this every time, depending on what I have in stock, but I make a consistent effort in that direction. I mention this because I’m open to receiving donations of such books to add to the collection. There’s obviously no guarantee of a review from this (unless I read it, which I often do), but it is an opportunity to get a book to an interested audience. It’s a small opportunity, true, but still an opportunity. Email me at LFL@sadieforsythe.com if interested.